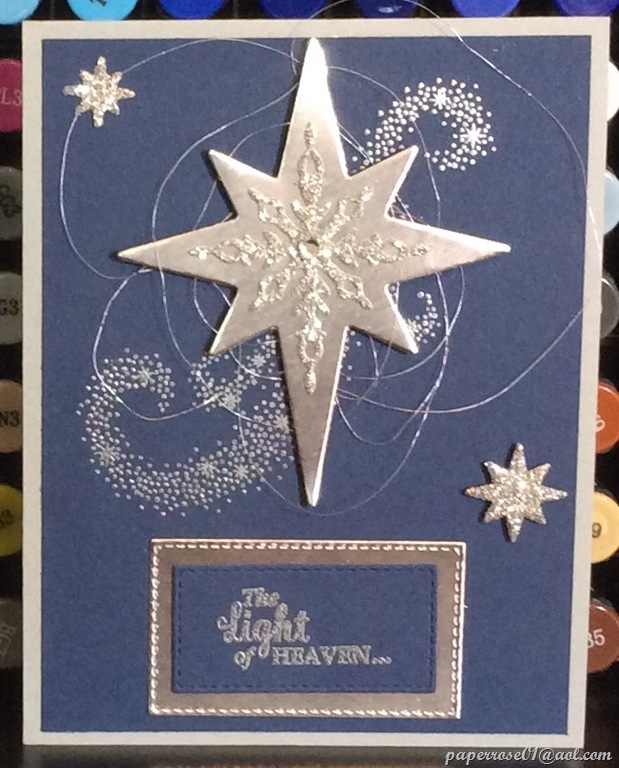 Star of Light is a beautiful stamp set and when combined with the Starlight Thinlits Dies, presents many beautiful possibilities. My sample features Silver Foil and Silver embossing on navy card stock. 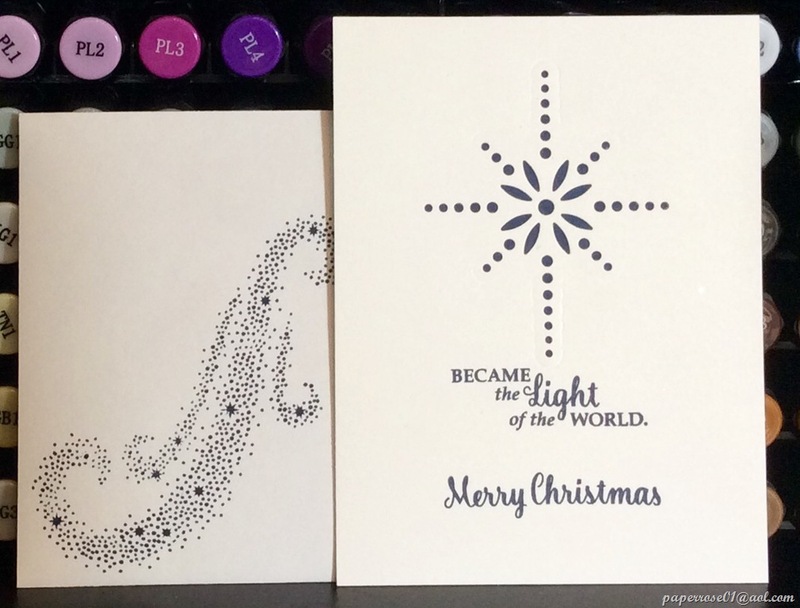 I love how the silver stars swirl across the paper. The large silver star is popped up on dimensionals and is highlighted by a smaller silver glimmer star with a rhinestone center. Two smaller silver glimmer stars flank the large star. The sentiment is embossed in silver and layered on stitched silver foil. The silver thread would not behave and wildly encircles the stars. This card would be eye-catching even if the silver thread is not used. I love how the stars swirl across the envelope. The stamp is simple to use but really enhances the envelope. The message layer is one of the options that can be used. This particular star die leaves a negative image. I slipped navy cs behind the image to help the star stand out. Other options are also available with this set. This 5 X 7 shaving cream card is a favorite of mine. I like the simplicity of the stark trees and deer against the blue sky and green grass. The white glimmer star is barely seen in this photo. 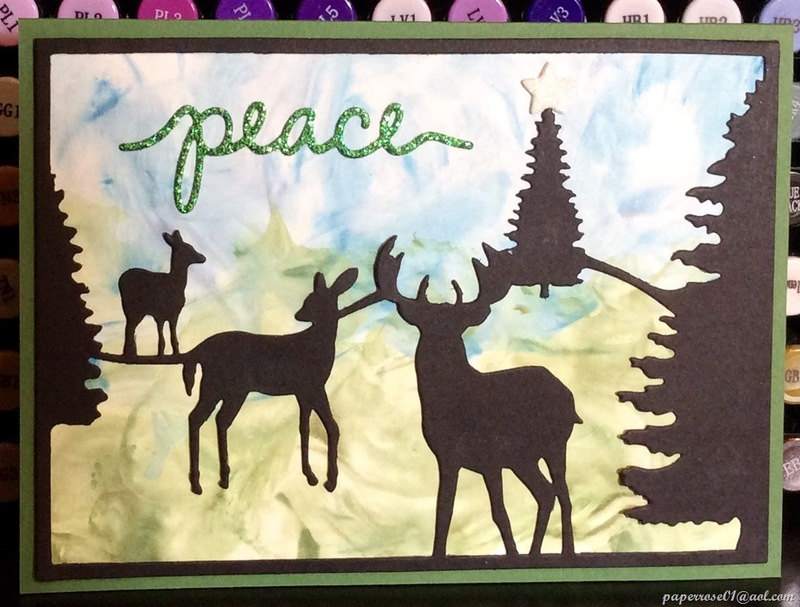 The green glimmer “peace” carries thru the color blue/green theme. Someone had asked if I had envelopes for these 5 X 7 cards and I’m happy to say I found this size in my envelope collection. This second sample is very similar to the one above but features silver stickles on the 3 trees. The important thing to do with stickles is to put the wet item far away so that nothing can touch it. I’m happy to say I was successful with this card. The background was sprayed with home brew after the shaving cream had dried which gives it a slightly shimmery background. The third sample features a background colored with Real Red swirled thru the shaving cream. The red stickles shimmering on the trees is more vibrant than the image shown here. A red glimmer “peace” and star stand out against the background. I mixed the shaving cream again after I colored the background seen here, and ended up with so much red that the scene appeared to be a forest fire in the background. I definitely decided not to use it. Remember to wear clothes that are not your Sunday-best if you choose to do the shaving cream project. These are the 2 Christmas additions to the November Stamp Camp. Remember to let me know your 4 choices by Tuesday, November 1st. If you wish to do more than 4 cards, additional cards are $2 each. I hope you can come. We will have a festive time preparing for the upcoming festive holidays. Don’t hesitate to contact me with questions, concerns or comments. And remember – Christmas in November is right around the corner – November 17 and 19. 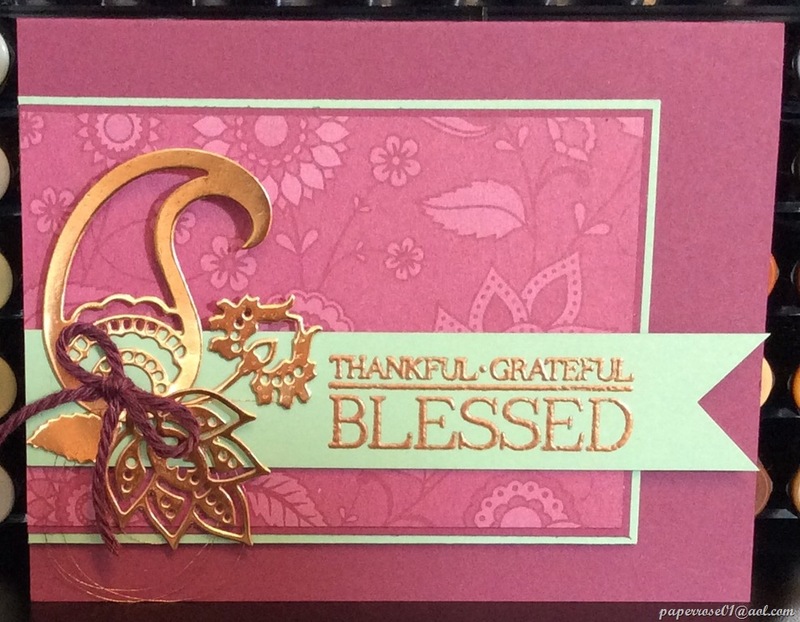 This elegant card is from the Paisleys & Posies stamp set with the Paisley Framelits Dies. The color scheme is Rich Razzleberry, Mint Macaroon, and Copper. Petals and Paisleys Specialty DSP provides a background of the paisleys and posies. 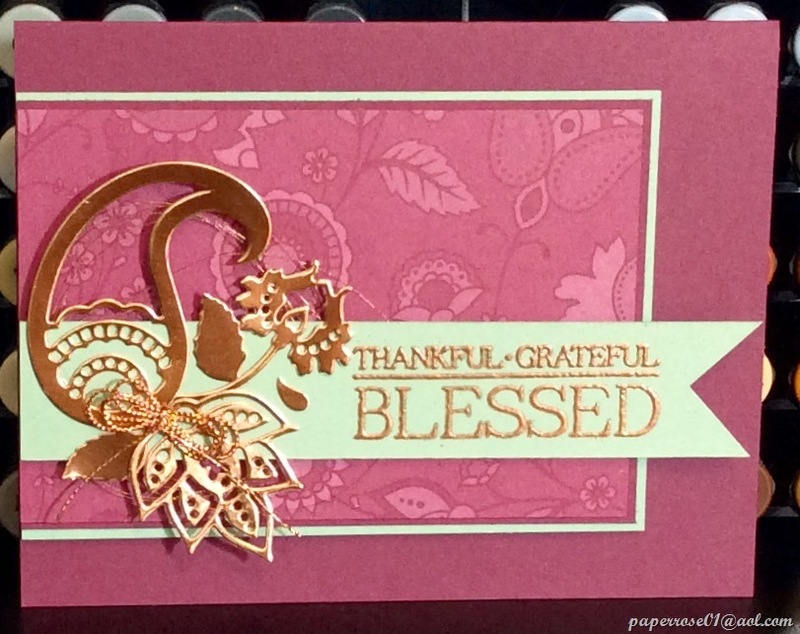 The gorgeous copper foil sheets die cut into wonderful embellishments. The banner message is wet-embossed on Mint Macaroon and provides a bit more elegance. Retired copper cording tied in a triple bow is the finishing touch. The second sample is very similar to the first but missing a second leaf and a tiny paisley. Rich Razzleberry thick Baker’s Twine provides a simple bow. Although both samples use the thin copper thread, the thread is more noticeable on this card located under the embellishments. With a simple message change, this would also make a beautiful Christmas card. Our second Thanksgiving card features thankful mice from Lawn Fawn. 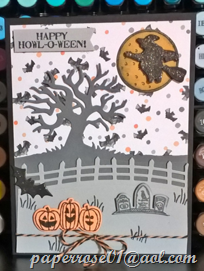 The addition of die cut pumpkins and stitched leaves on a Peekaboo Peach background give a fall feeling. The So Saffron card and plaid DSP provide a bit of whimsy. The stitched hills are a new addition to my ever-growing die collection. There are dies for everything on this cute card. These are our Thanksgiving cards for November Stamp Camp which will be held on Thursday November 3rd from 12 N to 9 PM, Friday November 4th from 2 to 9 PM, and Saturday November 5th from 9 AM to 4 PM. You can choose the 4 cards you wish to do. If you choose to make more than 4 cards, the cost is $2 per card. However, the deadline for letting me know which cards you choose, is Tuesday, November 1st. The post focusing on the 2 Christmas samples will be out shortly. Don’t forget the Buy 3 – Get 1 Free Stampin’ Up sale. This special ends with the last day of October. Which 4 cards will YOU choose? 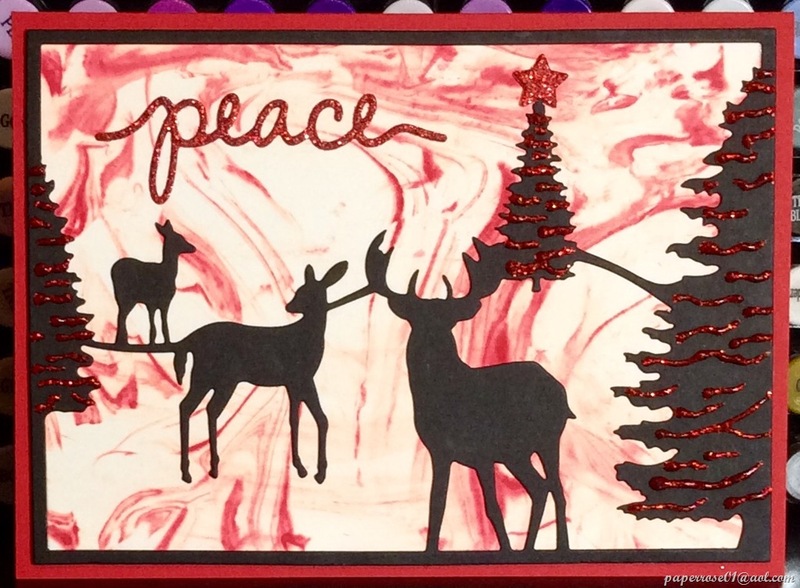 GINGERBREAD CHRISTMAS is the Christmas card for October Stamp Camp. Doily choices include gold, silver, or matte white. There are punches for all the cookie cutter people, hat, bow, etc. 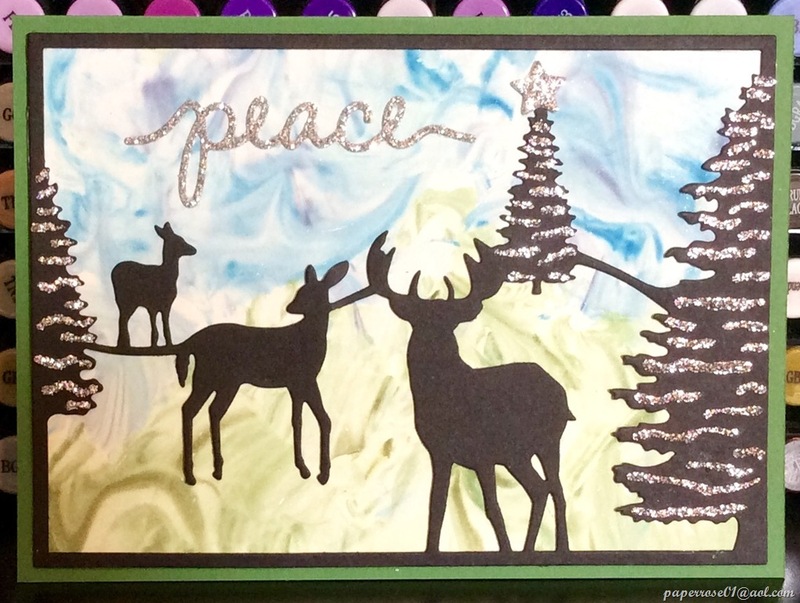 Check out the new embossing folder! Other COOKIE CUTTER HALLOWEEN options. 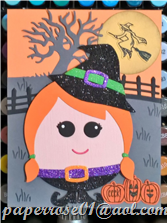 ROLY POLY WITCH is a cutie and can be crafted with a Basic Gray or a Basic Black tree. The witch pieces are all die cut. The tree and fence have edgelit dies. Check out the sentiment on the first pumpkin – EEK! 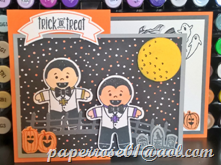 SPOOKY FUN is another choice for October Stamp Camp. Edgelit dies for the tree and fence. Dies also for the witch, pumpkins and gravestone. LEAVES ON A SHAVING CREAM BACKGROUND is fun to do as you can make your shaving cream background any color you wish. Remember that this can be a bit messy! Acorns vary in color and sentiment. So there you have it! 5 card options to choose from. But please let me know as soon as you can what cards YOU want to do! October Stamp Camp: Thursday October 6 from 12N to 9 PM – Friday October 7 from 2 to 9 PM – Saturday October 8 from 9 AM to 4 PM. If you can let me know which day you are coming, it is helpful – but not required. Cost is $12 for 4 cards and $2 for each card beyond 4. Remember to let me know which cards YOU want to do. Let me know if you have any questions or concerns.